I did have a dropped call yesterday while driving, but I believe that was a coverage issue. Two updates in less than 40 days, that can be a double edge sword for a product. Don't get me wrong, I am very happy with Apple releasing bug fixes, but this can also help fuel rumors that a product is unstable. After the update I am noticing that my Edge signal is much stronger in my house than before. I can only get Edge inside my house. I can get 3G outside but it is sporadic. I have not had any dropped calls since AT&T sent a SIM card update to my phone and I updated to the newest firmware available at the time. (argh, were is that cut and paste for the URL). I have read that there is an estimate of about 2% of iPhone 3Gs that have problems keeping connections. I guess I an lucky or my instructions worked (LOL). If there is anything else noticeable I will report back. Use your traffic enabled GPS device . My aging BMW GPS system does not display traffic data in the US. In Europe it would work just fine with TMC, but that system never took off in the US. A newer version of TMC is now being implemented in the US via satellite and FM radio but that is not currently an option for me. I use my Internet enabled mobile device to display live traffic using Windows Live Search or Google. The quickest method is number 4, unless you hit the appropriate radio traffic report in time to make your re-routing decision. My problem to date with number 4 has been to easily display the appropriate map using one hand. Getting your location quickly simplifies the process of displaying the appropriate section of map avoiding any fumbling with the device. With my Tilt, the GPS acquisition time is hit or miss. Sometimes I can get it in 30 seconds, other times the only way to get a fix is to use Quick GPS but that takes additional steps and time. Using the Tilt in this situation is just not reliable. In comes the iPhone 3G, with the location service and Google Maps traffic turned on, displaying traffic is three presses (turn on, Google maps, and find location) and an unlock slide away. The location acquisition happens within 20 seconds, it uses the 3 built in (cell, WIFI, and GPS) methods in sequence to get the most accurate fix and displays the appropriate portion of the map. I was able to determine by viewing the map that the length of the backup did not indicate congestion and was probably due to an accident. I rerouted my trip via back roads which extended my trip by about 10 minutes. Who knows how long it would have taken me to get through the backup. When I listened Sirius radio traffic, they confirmed that it was accident and the current backup was about 10 miles. Last Wednesday was my 14 day return end date with Apple and I have decided to keep the iPhone 3G. Even though there are growing pains with both Apple's software and AT&T's network, the iPhone's user interface and web browsing functionality is so compelling that I am willing to give it time to develop. The key to my benevolence is Apple's control over the delivery of updates (vs Windows Mobile OEM model) on a regular basis. It looks like they plan on delivering 4 to 7 updates in the next 12 months, although I think once a quarter is probably reasonable. They essentially implemented the minimum Exchange ActiveSync functionality which is OK, but I really want the calendar invite and flagging functions (I need to write another post on the subject). There are also application issues which maybe due to the SDK or the developers. I tried to use the Typepad application to blog this entry. When I was ready to post, I received an undefined server error. I terminated the application by holding the home key and lost my pending and draft posts. Not a good user experience...This post was rewritten using ECTO on my PC. In the end, I just find myself using the device more to respond to email and browse the Internet. I am missing a full featured PIM, and over time I will have to see how much of an impact that has on my use, but I know Pocket Informant will be available in the next couple of month. I find that the on screen keyboard works well for me. I would like a stronger dictionary/spell checker but it does pretty well. You have to let the system perform its correction function even if you misspell a word. The correction will appear once you hit the space bar and it works 90% of the time. It is interesting that problems are being reported, but the buzz for acquiring the device is still there. This last weekend there were lines at the local Apple stores, 3 weeks after launch. I really like the user experience on the iPhone, but the Exchange ActiveSync requires some work and I have had a strange calendar issue which I will document in a separate post. I am getting use to the finger typing, the system is learning the words I use and it seems to be getting easier. Creating emails is faster experience than in WM. The contact chooser is more intuitive and with my new found finger typing skills, the whole process seems faster. Form factor: I like how it feels in my hand, it is thinner that the original but I think the feel of the plastic case made a bigger impression on me that the thinner design. Screen size: Apple did a great job picking the iPhone's screen size. I find the 3.5" screen is a big plus over the 2.8" on my AT&T Tilt. Exchange ActiveSync is as easy to set up as on a Windows Mobile device. The GPS position acquisition is excellent, especially compared to the AT&T Tilt. Battery life is poor (I am adjusting my previous comment). Yes, I still think battery life is poor, however I can't compare it to the Tilt because I rarely used it with WIFI. The one great usability factor for the iPhone is that you can actually use the web browser for more than mobile sites. As statistics have pointed out the majority of iPhone users browse the Internet. This is not the case with Windows Mobile users. You need 3G or WiFi to effectively browse the Internet. Since coverage in my house is poor, I use WIFI thus driving battery usage. This means I have to charge it once during the day. A bummer but manageable and manage radios on and off. 3G reception lousy in my house. No spell checker, the dictionary is there for suggestions, but a spell check feature would have been nice. No Pocket Informant, Sling Player mobile, Windows Live Search. Those are probably the applications I use the most. Note2Self works very well, recording play in Outlook 07 preview, and the start recording when you place the unit up to your face is great. eWallet looks good but the lack of synchronization currently makes it a bust for me. Can't wait until the beginning of August for the update which includes the synchronization module. Audio Recorder is a nice application, tech support has been helpful but I have 2 major problems with the application. First I can't email recordings from my home network (an update is supposedly in the works) and the sound file format is in a non de facto standard. By that I mean it uses Core Audio Format files for which you have to download codecs or compatible players to use. Not too user friendly. Typepad application. Along with the i.typepad.com sites provides all the functionality I am looking for: create/edit posts and manage comments. There is a bug with the cropping of screen prints. Typepad support is looking at that issue. It would begreat for Typepad to include the iPhone's web site functionality into the application. Twittelator is a Twitter application which has everything I need. From the comments it is not as fancy as Twitterific, but for free you can't beat it and it has no ads (the free version of Twitterific has ads). I am still amazed that I actually waited 9 hours to purchase the iPhone. It seems like a blur, and does not seem like it was that bad (interesting how you can rationalize such events). It was not so much the waiting but what I could have done with that time. I did do about 4 hours worth of work between my 3.5 hours worth of X60 battery time and phone calls; that left 5 hours of essentially milling around and talking to fellow line mates hoping Apple employees would move faster, then dreaming of the end game. But that is all over now and it is time to see if this version of the iPhone is worthy enough to become my daily driver. Since I purchased it at the Apple store, 95% of the purchase experience was performed with a Microsoft Windows CE Symbol device, the last 5% was the iTunes activation on a Mac. 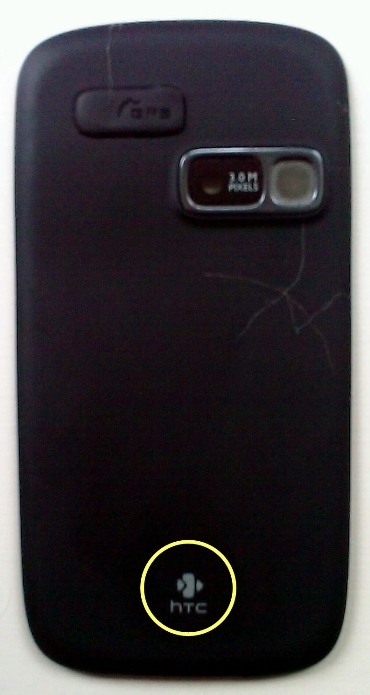 I have 14 days to return it (until July 30th). If I choose to return it, I will have to pay a 10% restocking fee ($30) which is better than being stuck with a $300 device I will seldom use and a 2 year AT&T contract. I have already forwarded my T-Mobile number to the iPhone. I have a 1000 minutes of forward minutes which should work fine with my 450 minute iPhone plan. Exchange ActiveSync is as easy to set up as on a Windows Mobile device (more to come on ActiveSync differences). The GPS position aquisition is excellent, especially compared to the AT&T Tilt. Battery life is poor. I unplugged it around 8AM yesterday, at about 3:30PM the battery was down to 20%. I have WIFI and Bluetooth turned on with occasional GPS use. I used it as I would my Tilt. At this point in the day I am used to having at least 50% left. Just like the recessed headset jack in the 1st generation iPhone which was ridiculous, I think the Apple designers went crazy on trimming the width of unit at the expense of a larger battery. I would gladly have the iPhone 3G be the same width as the original to have more battery time. No Pocket Informant, Sling Player mobile, Note2Self, Windows Live Search and eWallet. Those are probably the applications I use the most. I know all of these will come soon enough. Ilium has pushed eWallet to Apple, however they have delayed the deployment to the app store because of some additional checking that they must do (event hough Ilium has all the paperwork done) because of the export controls on encryption technology. The only application I currently installed is the Typepad blogging application which is nice but I feel it is missing a major piece of functionality: being able to update current published posts. I am starting to better comprehend the UI paradigm and it does differ from what I am used to in Windows. An example of that the applications that I have tried do not have a save button. Example: In the Typepad and Mail application you click on the Cancel button and it brings up a menu to save and/or exit. I am not sure that I agree with this paradigm but I can see that you could argue both ways. There are many applications in Windows that will perform the same way by clicking the x, but the majority of them also have a prominent save function. So my issue is really with the lack of a save function front and center. As Windows Mobile geeks, we all know the HTC brand name. However, the average consumer in the US is clueless that Hi Tech Computers (HTC) is the world's largest maker of Windows Mobile phones. HTC is about to try to change this in the US with a multi million dollar advertising campaign dubbed "Set Your Fingers Free" which will be running in print, outdoor, online and on cable TV channels. The TV spot can be seen on HTC's US web site. It looks like the ad campaign is an admission that people want to use their fingers rather than a stylus, and of course an ode to the iPhone.. In an attempt to develop more brand awareness in the US, a year ago HTC placed it's logo on the back of each phone. The back of my AT&T Tilt. US residents can now also sign up for HTC's e-Club which includes hot fixes and ROM upgrades, however it is not much good unless you own an HTC branded device (no carrier devices can be registered). When I tried to register my unlocked AT&T Tilt which is an HTC Kaiser, I received this message: "Unable to register your serial number. The serial number you entered is not for an HTC branded product". 1. 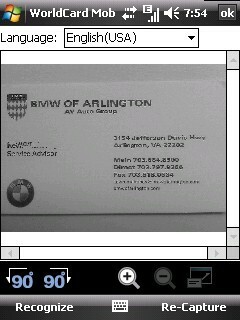 Take picture of business card. 2. It does an excellent job of recognizing all of the text and places it in the appropriate fields. 3. Export to a contact record. 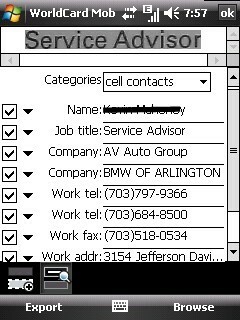 Then, the beauty of ActiveSync comes into play; the contact is automatically synchronized with Exchange for use with Outlook and other compatible device. The only minor issue I had was that the address was created as a single line which included city, state and zip, I had to add a carriage return in front of city for the address to be properly formatted. This is one of those handy little applications which makes your life more efficient. Typepad is migrating its blogs to a new platform which helps with mobile rendering. Although Typepad still does not reformat for mobile devices, it does do a much better job at creating html that mobile browser can easily interpret. In the past mobile browsers failed to render my 3 column blog into anything that would be easily viewed. Now the 3 columns are rendered sequentially and displayed at a reasonable speed even over T-Mobile Edge network. The columns get displayed in order. To enhance the rendering speed, I have moved items from the left sidebar column to right one. Since I really don't use Twitter on a daily basis and I have not decided its value, I have moved it to the bottom of the right sidebar. I have viewed my blog on my AT&T Tilt and WM 6.1, as well as the iPhone. I happy to report that the blog is now easily readable on a mobile device.